What used to be an agonizing process in Photoshop, now only takes seconds using the "Color Accent" feature in the Canon PowerShot SD630, SD700 and their brethren. This is one of those gimmicks that you might pass by in the owner's manual without ever trying. My advice, if it's included in your camera, go try it now. Color Accent works like this. First you look at a composition and decide what color to feature. Navigate to Color Accent mode, point your spot meter marker in the LCD viewfinder at the color, and press the appropriate button on your camera to "mark" it. Your camera notes that color. Now, when you take a photo, everything else in the composition turns to black and white, except for the items that contain the color you marked. You can even control the density of the color rendered right there on the LCD. 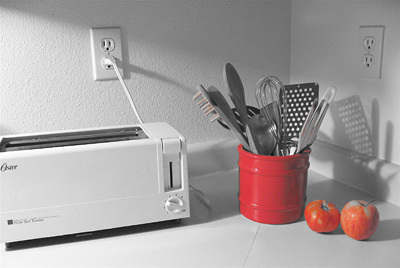 In the photo above, I marked the red of the ceramic canister holding the kitchen utensils. I also picked up some red in the tomato and apple. Everything else went to black and white -- all done in camera, and with a point and shoot at that. Now if I connected the camera to a direct print dye sub printer, such as my CP330, I can output a 4x6 inch spot colored photo without ever touching a computer or image editor. I've been having a blast with Color Accent. It really gets the creative juices flowing. If you have this on your camera, give it a try. If you're shopping for one, this is a feature to look for.